Bhí sé ar dhuine de phríomhphearsana dhrámaíocht na hÉireann san fhichiú haois agus ar dhuine den bheagán sin fairirí proifisiúnta a chaith lándúthracht le forbairt na drámaíochta Gaeilge. Is i nGaeilge a scríobh sé a dhírbheathaisnéis, Fallaing Aonghusa: saol amharclainne (2000). Cé is moite dá bhfuil in alt seachtainiúil Alan Titley (‘Crobhingne,’ The Irish Times), ag Micheál Ó Conaola in Foinse (Irish Independent 1 Meitheamh 2011) agus i ngnáthchuntas iontaofa The Irish Times 21 Bealtaine 2011, is beag aird a tugadh ar a bhfuil sa dírbheathaisnéis úd. In The Irish Times 23 Bealtaine 2011 tá cuntas ag Joe Dowling, pearsa mhór in Amharclann na Mainistreach tráth, ar an gcaidreamh a bhí aige le Mac Anna. In Independent na Breataine 31 Bealtaine 2011 tá cuntas eolach air ag a chara Ulick O’Connor, ach ní dhéanann seisean tagairt ar bith don Ghaeilge i saol agus i saothar Mhic Anna. I nDún Dealgan a rugadh é ar 7 Márta 1925. Ba í Caitlín Ní Bhroin ó Lú, sráidbhaile in aice le Dún Dealgan, a mháthair agus ba é Patrick McCann, arbh as Baile an Iúir, Bealach Cláir, Co. Aontroma, dó, a athair. Ba chléireach le Mór-Iarnród an Tuaiscirt é Patrick agus post sinsearach aige sa stáisiún i nDún Dealgan. Is i dteach de chuid an iarnróid, é os comhair an stáisiúin traenach amach, a rugadh is a tógadh Tomás. Ba é an ceathrú páiste ag an lánúin é. Cuireadh bunoideachais air i Scoil Naomh Maoilsheachlainn sular thosaigh sé i meánscoil na mBráithre Críostaí i nDún Dealgan. Is ag an bpointe sin a d’éag a athair. D’fhág sin gurbh éigean dóibh teach an iarnróid a fhágáil agus go raibh a máthair fágtha ar an ngannchuid go tobann, gan de theacht isteach aici ach pinsean baintrí an stáit. Ach ba bhean láidir í a d’fhéach chuige gur lean Tomás den mheánoideachas. I nGaeilge a bhí gach ábhar á múineadh ag na Bráithre agus bhí anáil nár bheag ar Thomás ag a mhúinteoir Gaeilge, an Bráthair Muiris Ó Cinnéide. Chaith sé tamall ansin sa Choláiste Náisiúnta Ealaíne is Deartha, Baile Átha Cliath. Is mar chúntóir leabharlainne a thosaigh sé ag obair i nDún Dealgan ach bhí ar intinn aige tamall dul le hailtireacht. Thagadh Anew McMaster agus a chomplacht go Dún Dealgan agus tháinig Tomás go mór faoi anáil an tsáraisteora sin. Bhí sé páirteach i ndrámaíocht amaitéarach an bhaile. Timpeall an ama sin ghlac Radio Éireann lena dhráma Mourne heather. John McDonagh, deartháir le Thomas McDonagh, laoch 1916, a bhí i gceannas ar dhrámaíocht an stáisiúin agus ba é a thug ar Thomás glacadh le ‘Mac Anna’ mar shloinne in áit ‘Mac Cana.’ Ghnóthaigh sé post mar oifigeach custaim agus is i gcalafort Dhún Laoghaire a thosaigh sé ag obair, rud a chuir ar a chumas amharclanna Bhaile Átha Cliath a thaithí. Ag an am sin d’oibrigh sé tamall gan phá mar chúntóir ag an bhfeistitheoir stáitse in Amharclann na Mainistreach. Ach ba ghairid gur aistríodh é go Béal Átha Seanaidh, Co. Dhún na nGall. Le linn dó a bheith ansiúd craoladh dráma beag leis (Quest for Susan Anne) ar raidió BBC agus bhailigh sé scata aisteoirí amaitéaracha chun Juno and the paycock le Seán O’Casey a stáitsiú. Chuidigh sé freisin le hamharclann a thógáil ar an mBun Beag, Co. Dhún na nGall. However, lest it be thought that Blythe was incapable of recognising and using artistic talent when he found it, his report to the Board on the work of a young Gaelic-speaking director Tomás Mac Anna, indicates that he was a shrewd judge of artistic ability, even if he sometimes abused it. Of Mac Anna’s first production for the Abbey, a Gaelic translation of Chekhov’s The Proposal [Cúrsaí cleamhnais] (16 September 1947), Blythe wrote, ‘We have struck a man who will be a tower of strength in the theatre’. Tá caibidil ag Mac Anna sa dírbheathaisnéis ar an mBlaghdach a thugann le tuiscint gurbh athair altrama aige é san amharclann sin. In Fallaing Aonghusa scríobh sé faoin lá a ceapadh é: ‘Pé scéal é, cosúil le Julius Caesar fadó bhí an Rubicon trasnaithe agam…’. Bhí i ndán dó bheith ag obair in Amharclann na Mainistreach anuas go dtí na 1990idí agus baint aige leis na céadta dráma, é mar dhearthóir stáitse uair, mar scríbhneoir, mar dhearthóir culaithirte, mar stiúrthóir ealaíne, mar stiúrthóir drámaíochta. Bhí an Chomhdháil Cheilteach ar tí teacht go hÉirinn in 1947 agus is ar Thomás a thit sé Casadh an tsúgáin le Dubhghlas de hÍde a léiriú in onóir na hócáide sin. As sin amach is iomaí sin cúram a thiteadh air: geamaireachtaí Nollag anuas go 1967, mar shampla, agus é go minic ar dhuine dá n-údair. Ní raibh fagtha in 1947 sa Mhainistir ach beagán aisteoirí a raibh líofacht Ghaeilge acu, daoine mar Mhícheál Ó Briain, Bríd Ní Loingsigh agus Máire Ní Dhomhnaill. Cuireadh go maith lena líon ar ball nuair a fostaíodh Seathrún Ó Góilí, Éamon Ó Guaillí, Ronnie Nic an Mháistir agus a leithéidí. Idir na 1940idí agus na 1990idí bhí trí thréimhse na Mainistreach feicthe aige: ar mhair go fóill den tseanamharclann a bunaíodh i dtús an chéid, agus cuid de na seanaisteoirí agus leithéid Lennox Robinson ann go fóill; an t-athrú saoil a tharla in 1951 nuair a chuaigh an amharclann trí thine agus gurbh éigean cúig bliana déag a chaitheamh in Amharclann na Banríona, Sráid an Phiarsaigh; agus an t-athrú saoil eile ó 1966 ar aghaidh san amharclann atógtha. In agallamh ar Radio Éireann (athchraoladh cuid bheag de ar chlár John Bowman ar 19 Meitheamh 2011) dúirt sé gur cailleadh san fhoirgneamh atógtha an dlúthchaidreamh sin a bhí ag na haisteoirí leis an lucht féachana sa tsean-Mhainistir. Bhí sé ina stiúrthóir ar chúrsa drámaíochta sa Damer in 1967. In 1966 chuir pobal leathan na hÉireann aithne air nuair a choimisiúnaigh an rialtas é chun glóir-réim mhór a reáchtáil i bPáirc an Chrócaigh d’fhonn ómós a thabhairt do laochra 1916. D’fhostaigh sé an t-aisteoir Phyllis Ryan (1923–2011) chun aisteoirí a thoghadh do na páirteanna go léir agus gheofar cur síos ar an mórócáid sin ina cuimhní cinn The company I kept (1996). I Nua-Eabhrac in 1970 stiúir sé Borstal boy, é bunaithe ag Frank McMahon ar leabhar úd Bhreandáin Uí Bheacháin, agus Niall Tóibín agus Frank Grimes sna príomhpháirteanna. Gnóthaigh an dráma sin ‘Tony.’ Agus neamhspleáchas na Stát Aontaithe á chomóradh in 1976, léirigh sé The plough and the stars le Seán O’Casey i Nua-Eabhrac, in Washington agus i mBostún. Thug sé Shadow of a gunmanUí Chathasaigh uair eile le cur ar stáitse in Baltimore. Níorbh annamh dó léachtaí a thabhairt nó drámaí a stiúradh anseo is ansiúd sna Stáit, i dTalamh an Éisc, i bPáras nó i Londain. Bhí sé ina stiúrthóir ealaíne in Amharclann na Mainistreach ó 1972 go 1978 agus arís ó 1984 go 1985 agus mar cheannasaí sa Phéacóg, post ar chuir sé tábhacht ar leith leis. Tar éis tamaill mhaith ann chaith sé tréimhse i rith na dtrioblóidí sa tuaisceart ag léiriú drámaí sa Lyric le hais abhainn an Lagáin i mBéal Feirste. Ag tagairt don bhá a bhí aige leis an bpoblachtánachas, dúradh sa tuairisc ar a bheatha in The Irish Times 21 Bealtaine 2011: ‘His republican sympathies led him in the 1970s to publicly declare his support for IRA prisoners on hunger strike in British jails; in the 1980s he supported the H-Block campaign’. Cheistigh mé an Bord [Amharclann na Mainistreach] tamall ó shin faoin easpa spéise a bhí go soiléir acu i ndrámaíocht na Gaeilge agus ba é an freagra a fuair mé ón gCathaoirleach, Nollaig Mac Piarais [Noel Pearson], nach raibh dualgas de réir dlí orthu drámaí Gaeilge a léiriú. The one area where there has been conspicuous failure to realize even a reasonable level of activity within all these diverse demands is that relating to drama in the Irish language. With the notable exception of Titley’s Tagann Godot (1990) and Antoine Ó Flatharta’s An Solas Dearg (1995) there has been no sustained creative activity in Irish language theatre since 1985. Sin í an bhliain a d’éirigh Mac Anna as a phost mar stiúrthóir ealaíne. Léiríodh drámaí dá chuid féin in Amharclann na Mainistreach – Winter wedding in 1956 agus Glittering spears in 1983 – agus sa Phéacóg: Dear Edward agus Scéal scéalaí (i gcomhpháirt le Éamon Kelly (1914–2001), aisteoir agus scéalaí) in 1972. Cuid de na drámaí cáiliúla a stiúir sé is ea: Diarmuid agus Gráinne (1947) le Micheál Mac Liammóir; The quare fellow (1955) le Breandán Ó Beacháin; Gunna cam agus slabhra óir (1955) le Seán Ó Tuama; The life of Galileo (1956) le Bertolt Brecht (is é a deir Hunt faoi: ‘…regarded by many as a break-through in lighting, production and acting’); Long day’s journey into night (1959) le Eugene O’Neill; Tarry Flynn (1966), bunaithe ag P.J. O’Connor ar leabhar Patrick Kavanagh; The loves of Cass Maguire (1967) le Brian Friel; Famine (1968) le Tom Murphy; Philadelphia here I come (1972) le Brian Friel; Tagann Godot (1990) le Alan Titley. In 1955 phós sé Caroline Ní Shiaráin ó Chora Droma Rúisc, Co. Liatroma, bean a bhí gaolmhar le Seán Mac Diarmada, laoch 1916. Nuair a chonaic sé a chéaduair í, agus gan puinn aithne ná eolais aige uirthi, is é a shíl sé gurbh í Úna Bhán féin ina steillbheatha í. Shocraigh sé láithreach ina intinn gurbh í a phósfadh sé. Rugadh cúigear clainne dóibh, beirt chailíní agus triúr buachaillí. Bhí cónaí orthu anseo is ansiúd: i nDeilginis ar dtús, i mBinn Éadair ar feadh i bhfad, tamall i seanteach an RIC in Indreabhán, Co. na Gaillimhe agus, ar deireadh thiar, i mBré. D’éag sé ar 17 Bealtaine 2011. Hunt, H. (1979) The Abbey, Ireland’s national theatre 1904-1978. New York: Columbia University Press. Ní Chinnéide, M (2008) An Damer: stair amharclainne. Indreabhán: Cló Iar-Chonnachta. 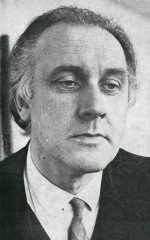 Ó Siadhail, P., (1993) Stair Dhrámaíocht na Gaeilge 1990–1970. Indreabhán: Cló Iar-Chonnachta. Ryan, P. (1996) The company I kept. Dublin: Town House.